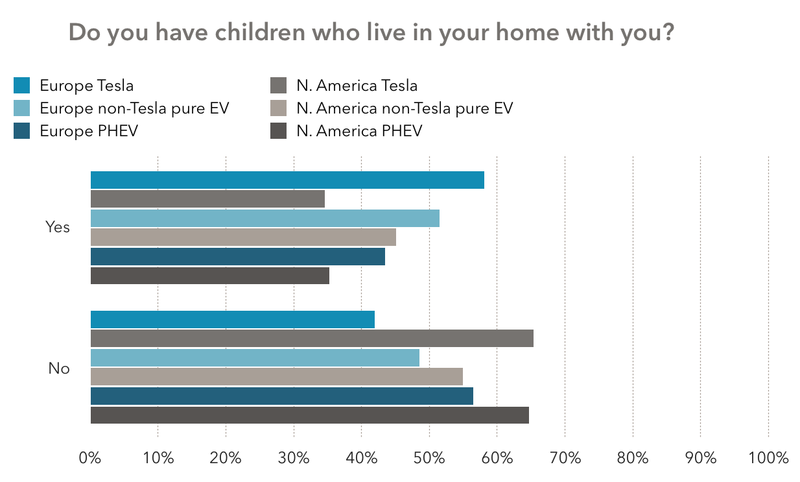 Previous surveys — including our initial EV driver survey — have found a strong link between driving electric cars and having home solar panels. Yet again, in our 2017 EV driver report, a very large portion of our respondents had home solar panels, which means that they are essentially “fueling” their electric cars with sunshine. 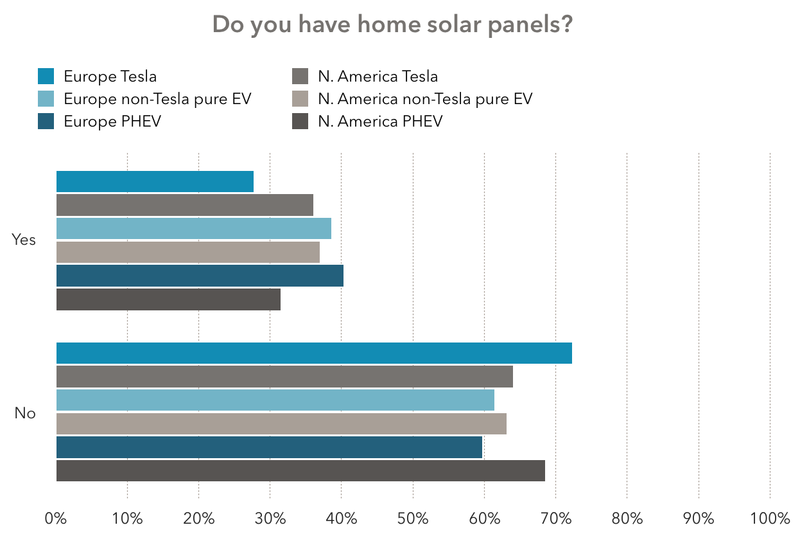 Across the six groups we surveyed, 28–40% of respondents said they had home solar panels. This is considerably more than the approximately 1% of homes in these regions that have solar panels. 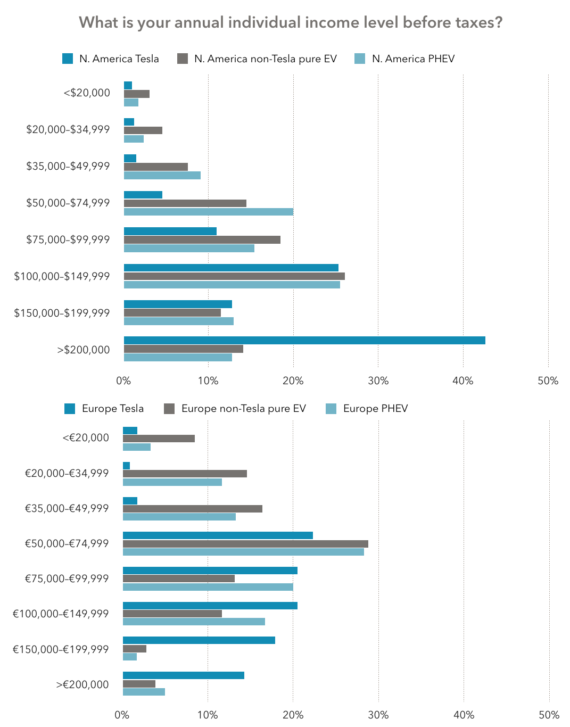 Interestingly, a European group (European PHEV drivers) had the highest percentage and another European group (European Tesla drivers) had the lowest percentage. However, the difference between them is pretty moderate and probably not statistically significant. Getting into some general demographics, we can see that approximately half of respondents (35–58%) had kids and respondents were primarily male (90–97%). 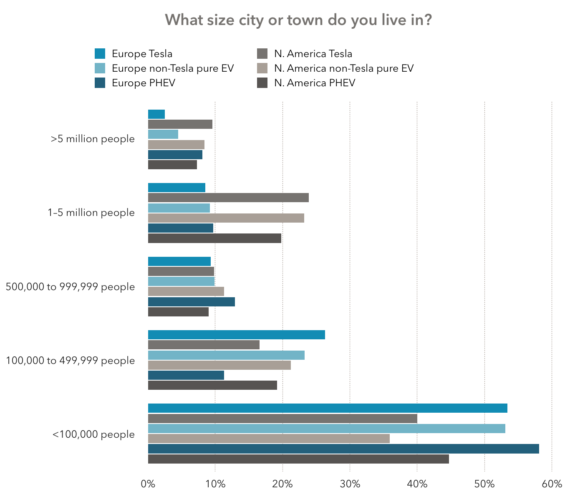 Another matter we dove into was the size of the cities or towns where respondents lived. It was surprising to see that so many of them were living in fairly small cities/towns — 36–58% in cities/towns with under 100,000 residents. Only 11–34% of respondents lived in cities of 1 million or more residents. Unsurprisingly, the respondents were rather wealthy. This is typical for early adopters of new tech, for people who buy or lease new cars, and thus for current electric car drivers. The North American respondents leaned more toward the higher income brackets than the European respondents. There are various factors on the micro and macro level that may have led to that, but it seems like it would be too speculative to discuss them here without more information. Another obvious divergence, of course, is that Tesla drivers had higher annual incomes. 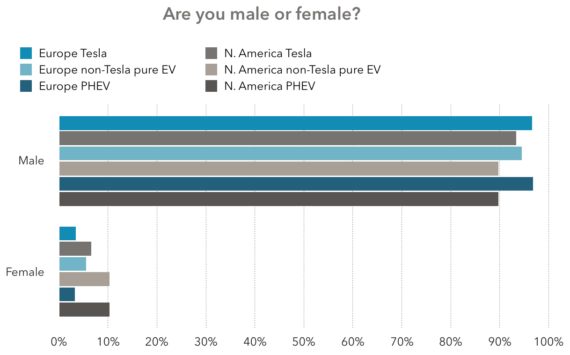 Nonetheless, a decent number of respondents in the first three to four income brackets did have Teslas as well. However, it’s unclear how much this related to wealthy retired people owning Teslas but no longer having high income. In general, this is a matter that should probably be teased out in future surveys. Our core partners for this year’s report included EV-Box, Tesla Shuttle, and Important Media. Other report partners included The Beam, EV Obsession, and the Low Voltage Vehicle Electrification summit.